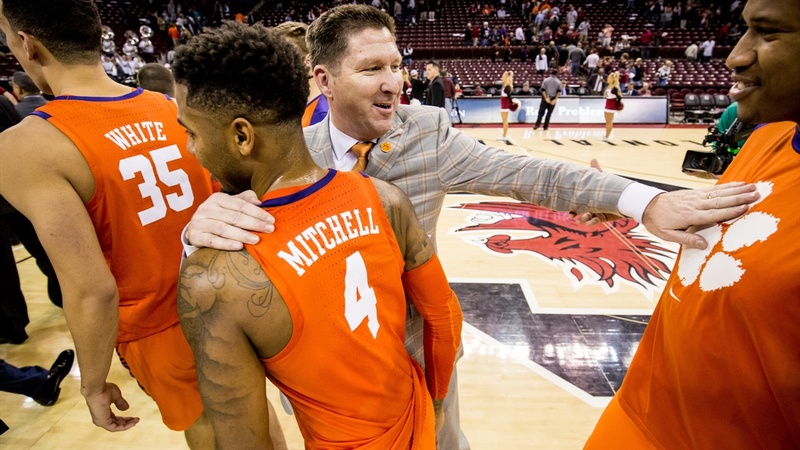 CLEMSON, S.C. — Head Coach Brad Brownell is again taking part in the Infiniti Coaches Charity Challenge, sponsored by the National Association of Basketball Coaches (NABC). The nation’s top coaches will be counting on fans to vote for them to help raise money for Coaches vs. Cancer. Brownell will compete against 47 other basketball coaches nationwide. Each vote helps increase Coach Brownell’s chances to get the $360,000 grand prize donated in his name. The coach finishing in second place will have $150,000 donated in his name and third place will see $90,000 donated. Fans are encouraged to vote a total of three times per day (once on each platform) via InfinitiTimeout.com Twitter and Instagram. No log-in is required for the website and fan social media accounts must be public, not private, for votes to count. You can visit the ESPN micro site www.InfinitiTimeout.com to vote each day for Coach Brownell. (1) TWITTER: Use hashtag #TIMEOUTFTW and @Coach_Brownell or #CoachBradBrownell with a photo taking a timeout. (2) INSTAGRAM: Use hashtag #TIMEOUTFTW and #CoachBradBrownell when posting your timeout photo. A retweet of a Twitter post that includes the appropriate hashtag and @Coach_Brownell will also count as a vote. Voting ends on Monday, March 11 at 9 a.m. ET.